Adhering to a consistent style improves readability and brand recognition. 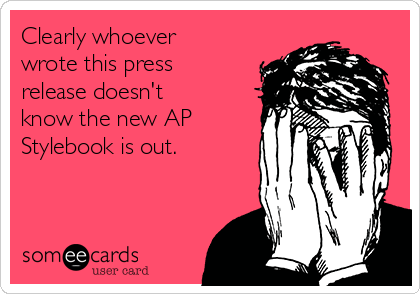 Using AP style gives you a common language with journalists, who often become the mouthpiece for your messages. Many public relations agencies and corporations interviewing potential employees will require an AP style writing or copyediting test to ensure new hires come in able to write in this style from day one. It’s worth your time to learn the basics of AP style that will surface again and again in your writing. Every word has one and only one spelling. Far fewer words should be capitalized than you think. Always look it up before you capitalize anything other than proper names. Including an abbreviation in parentheses immediately after a name usually is not necessary. In most cases, capitals and periods are not necessary for an abbreviation. Some abbreviations are appropriate on all references: FBI for Federal Bureau of Investigation. Punctuate according to generally accepted rules. “Oxford comma” (e.g., The flag is red, white and blue). The book is a great reference tool. When in doubt, LOOK IT UP. In general, spell out zero through nine. Many exceptions and contingencies to this rule. Look up “numerals” entry in the stylebook. An updated version of the stylebook is published annually. Some years, the changes are minimal and other years they are more significant. Many times organizations will use AP style as their overarching style but customize specifics such as how to abbreviate the organization’s name or whether to capitalize the names of its boards or committees.